The U.S. Revenue Cutter Service, fore-runner of the modern U.S. Coast Guard, saw action during the Spanish American War. The vessels served "In cooperation" with the U.S. Navy during the conflict. At the conclusion of the Revolutionary War the first Secretary of the Treasury of the newly formed United States of America, Alexander Hamilton, was immediately tasked to put in order the finances of the new Republic. This was not an easy undertaking, the government was struggling financially and also trying to come to grips with the ongoing maritime smuggling of goods into the country, which had been considered a patriotic duty prior to and during the Revolutionary War with the English, but was now considered detrimental to her very survival. Hamilton quickly realized that collecting tariffs on imported goods would be the means for generating the critical revenue that the country’s treasury so desperately needed. At the same time, he also realized the smugglers would resist and actively attempt to circumvent the government’s collection efforts. He proposed the construction of 10 manned and armed cutters to collect and safeguard the revenue. From the beginning, Secretary Hamilton insisted that the officers of the new service were to be appointed, commissioned , and provided with military naval ranking. During the Quasi-War with France in 1798-1801 the United States Navy was founded and the Revenue Cutter Service would fight alongside the Navy capturing, or helping to capture, 20 French ships (ten of those would be captured by RCS Pickering). This was the precedent that would temporarily transfer the Revenue Cutter Service to the Secretary of the Navy and her cutters to serve under the command of the United States Navy in time of war. On July 31, 1876 Congress established the first School of Instruction to train officers for the Revenue Cutter Service at New Bedford, Massachusetts. In May of 1877, the first nine cadets arrived to begin their two-year program of instruction. In 1914 the academy’s name was changed to Revenue Cutter School of Instruction and in 1915, the school would be renamed United States Coast Guard Academy. In 1932, the academy was relocated to New London, Connecticut. 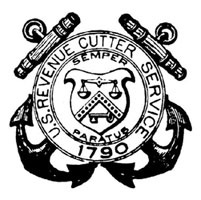 For 177 years the Revenue Cutter Service (later renamed Coast Guard) would operate under the authority of the United States Department of the Treasury. After the United States declared war with Spain on 21 April 1898, President McKinley directed the temporary transfer of the Revenue Cutter Service to the direction of the Secretary of the Navy and directed that all RCS cutters cooperate with the U.S. Navy as part of the Auxiliary Naval force (note that in data below "date of transfer" refers to the date the vessel was placed under the direction of Secretary of the Navy). The Auxiliary Naval Force was made up of vessels and personnel from the various states’ naval militias, the U.S. Light House Service, U.S. Fish Commission, etc. The Revenue Cutter service had 13 of its cutters (mounting 61 guns and aggregating 98 officers and 562 enlisted men) working in cooperation with the U.S. navy. Eight of the vessels served with the North Atlantic Squadron (43 guns, 58 officers, 339 enlisted men). One vessel, the HUGH McCULLOCH (6 guns; 10 officers, 95 enlisted men) served in Admiral Dewey's Asiatic Squadron. Four vessels - apparently the CORWIN, GRANT, PERRY and RUSH - patrolled the U.S. west coast from San Francisco to Alaska "in order to protect the treasure-laden vessels from the Klondike gold fields." These vessels mounted 12 guns, 30 officers, and 128 enlisted men. The most well-known actions involving the vessels of the Revenue Cutter Service are the actions of the HUGH McCULLOCH and the HUDSON. On 17 April 1898 the RCS HUGH McCULLOCH, commanded by Captain Daniel B. Hodgson, U.S.R.C.S., lightly armed and on a round-the-world shakedown cruise, joined the ships of the Asiatic Station at Hong Kong and was placed under the command of Admiral George Dewey. HUGH McCULLOCH’s first notable act was less that conspicuous. As Asiatic Squadron attempted to enter Manila Bay unobserved, flames momentarily issued from the HUGH McCULLOCH’s funnel betraying the blacked-out. squadron, though it was probably already spotted. On 1 May 1898, she would participate in the Battle of Manila Bay, Philippines, guarding the supply vessels ZAFIRO and NANSHAN. The HUGH McCULLOCH also carried the first reports of the battle to Hong Kong for communication with the outside world, and carried Filipino leader (and eventual U.S. adversary) Aguinaldo to the Philippines. Also, significantly, when conditions deteriorated between the U.S. and German naval forces following the Battle of Manila Bay, the HUGH McCULLOCH fired a shot across the bow of the German warship CORMORAN when she broke the U.S. blockade of Manila. The HUGH McCULLOCH also captured the Spanish gunboat LEYTE. On the 21st of April the U.S. Navy blockade of Cuba began with eight RCS cutters assigned to Admiral Sampson’s fleet. On May 11, 1898 at the Battle of Cardenas, RCS HUDSON, commanded by Lieutenant Frank Hamilton Newcomb, USRCS, would successfully rescue the disabled Navy torpedo boat U.S.S. WINSLOW while both were under a galling Spanish fire. On January 28, 1915, President Woodrow Wilson signed into law the Act to Create the Coast Guard. As a result of the Act the United States Revenue Service and Lifesaving Service were consolidated to form the United States Coast Guard. On April 1, 1967 the United States Coast Guard was transferred to the Department of Transportation. 2002 which created the new Department of Homeland Security. Under the legislation, the United States Coast Guard was transferred from the Department of Transportation to the new Department on March 1, 2003. The HAMILTON, commissioned in October, 1871, was an iron-hulled vessel, carried one 4 inch gun. She served with the North Atlantic Squadron. On August 10, 1898, she departed Key West, Florida, bound for the blockade off Havana, joining the fleet the following day where she delivered mail, and took up station with the blockading force. The following day she came under enemy fire but, rather than return the desultory shots, she hauled off out of range. With the armistice agreement on August 13 she completed her brief tour on blockade and headed, via Key West, to Charleston, South Carolina, where she arrived on August 17 ending her co-operative service with the U.S. Navy. Surgeon Charles H. James, Jr. The ALGONQUIN served with the North Atlantic Squadron and mounted two guns in her main battery. On August 17, 1898, she left service with the U.S. Navy.
? June 26, 1898 ? ? ? 174 tons ? ? ? The CALUMET served with the North Atlantic Squadron and mounted two guns in her main battery. The vessel was commanded by 1st Lt. W. H. Cushing, U.S.R.C.S. The vessel served with the Navy from June 26, 1898 until August 27, 1898. The CHIPPEWA was assigned to the Stayed in the Great Lakes during the war. Buffalo, New York April 24, 1898 165 ft ? ? ? ? ? ? The PERRY, commissioned in 1884, was an iron-hulled, single screw vessel, which was also provided with a brigantine rig. She served with the Pacific Squadron protecting vessels travelling between San Francisco and the Klondike gold fields. The vessel was commanded by Capt. W. F. Kilgore, U.S.R.C.S. The PERRY served with the Navy from April 24, 1898 until August 24, 1898.
? ? ? ? ? 424 tons (estimated) ? ? ? The CORWIN, a wooden-hulled vessel, served with the Pacific Squadron protecting vessels travelling between San Francisco and the Klondike gold fields. The DEXTER was assigned to the Port of Narraganset Bay, Massachusetts. The GALVESTON was not transferred to the Navy during the war, but was used to aid in the defense of New Orleans. In 1900, she was renamed APACHE. The GRESHAM, commissioned on May 30, 1897, served with the North Atlantic Squadron. She was a steel-hulled singled screw vessel. She was altered for naval service, and after completion of the alterations, patrolled the northeast coast of the U.S. She ceased naval service on August 17, 1898. The vessel carrired four Driggs-Schroeder rapid-fire guns. Camden, New Jersey March 24, 1898 94 ft 6 in 20 ft 6 in 10 ft 3 in 174 tons 12 knots 23 Crewmen ? The HUDSON, commissioned on August 17, 1893, was a steel-hulled, single-screw vessel, with an engine capable of generating 525 horsepower. She had three guns - two six-pounders and one Model 1895 Colt automatic machine gun - in her battery. The vessel, operating under the command of Lt. F. H. Newcombe, served with the North Atlantic Squadron, distinguishing herself on various occasions. Her most notable action was at Cardenas, where she towed the badly damaged torpedo boat WINSLOW out of range of Spanish guns during a hot battle. Click here to read more about this engagement. In addition, she captured two small fishing sloops attemptig to run the naval blockade of Cuba. Generally, she was used as a dispatch vessel. Philadelphia ? 219 ft 33 ft, 4 in. 14 ft. 1,280 tons 17.5 knots 68 officers and men ? The McCULLOCH served with the Asiatic Squadron and was involved in the Battle of Manila Bay. For a full account of this vessel, click here. For a crew roster of the McCULLOCH, click here. The vessel was not actually transferred to the Navy during the war, but aided in guarding Baltimore from May 9 to July 20, 1898. The vessel was a wooden-hulled, single screw ship, carrying seven guns in its main battery. The WOODBURY, originally built as the RMS (Revenue Marine Service) MAHONING, was placed in commission on July 18, 1864. The vessel was renamed RMS LEVI WOODBURY on June 5, 1873. During the Spanish American War, the vessel served with the North Atlantic Squadron and took part in the blockade of Havana. The vessel continued to serve with the USRCS until the U.S. Coast Guard was created on July 19, 1915, when she was placed out of commission at Portland, Oregon. Wilmington, Delaware ? ? ? ? 346 tons (estimated) ? ? ? The McLANE was an iron-hulled vessel and served with the North Atlantic Squadron. The vessel had originally been constructed as the side-wheel steamship VIRGINIA DARE, but was purchased on by the U.S. Navy in October 1861 and commissioned as the U.S.S. DELAWARE. In August, 1865, she was sold to the Department of the Treasury, becoming the RMS (Revenue Marine Service) DELAWARE. She was renamed RMS LOUIS McLANE on June 1873 and then USRC LOUIS McLANE on July 31, 1894. Massachusetts ? 205 ft 32 ft 13 ft 9 in 980 tons 15 knots 10 officers and 65 enlisted men ? The MANNING, commissioned on January 8, 1898, was a composite-hulled, single-screw vessel, with an engine capable of generating 2,000 horsepower. She mounted three small-caliber guns. The MANNING served with the North Atlantic Squadron. Second Assistant Engineer Hermann Kotzschmar, Jr. The MORRILL was an iron-hulled, single screw vessel. She mounted two three-pounder guns and served with the North Atlantic Squadron. The vessel was commanded by Capt. H. D. Smith, U.S.R.C.S. The MORRILL served with the Navy from March 28, 1898 to August 11, 1898. Cleveland, Ohio March 28, 1898 205 ft 6 in 32 ft 13 ft 2 in 1,190 tons 16 Knots 73 Crewmen ? Massachusetts ? ? ? ? ? ? 40 Crewmen ? Launched on March 14, 1873 and Commissioned on July 21, 1874, RUSH served with the Pacific Squadron protecting vessels travelling between San Francisco and the Klondike gold fields during the Spanish American War. The vessel carried three guns in her battery. The GRANT, an iron-hulled, single-screwed vessel, served with the Pacific Squadron protecting vessels travelling between San Francisco and the Klondike gold fields. She ceased her naval service on August 15, 1898. She was sold by the Revenue Cutter Service in 1906. Third Lieutenant Eugene Blake, Jr.
Dubuque, Iowa March 24, 1898 170 ft 8 in 27 ft 8 ft 3 in 525 tons 15 knots ? ? The vessel was still incomplete when she was moved from her builder to Baltimore, Maryland and completed. Commissioned by USRCS on June 30, 1896, the WINDOM was a steel-hulled, single screw vessel, with an engine capable of generating 800 horsepower. She carried one small-caliber gun. The vessel served with the North Atlantic Squadron. The vessel was commanded by Capt. S. E. Maguire, U.S.R.C.S. The WINDOM served with the Navy from March 24, 1898 until August 11, 1898. This vessel was later renamed COMANCHE. Wilmington, Delaware ? 149 ft ? ? 321 tons ? ? ? Commissioned by the USRCS in 1890, the WINONA patrolled the waters off Mobile, Alabama during the Spanish American War. Clerk of Joint Committee on Printing, The Abridgement of Message from the President of the United States to the Two Houses of Congress. (Washington: Government Printing Office, 1899). Vol. 2., 981, 1013, 1090, 1091, 1106, 1109, 1222-1223, 1230. Dictionary of American Naval Fighting Ships. Vol. III (Washington: Navy Department, 1977) 135, 157, 385. Mooney, James L., ed., Dictionary of American Naval Fighting Ships, Vol. 1, Part A (Washington: Naval Historical Center, 1991) 183, 328. RG 26, Entry 188 (NC-31) Box 6, Algonquin, 1898 – 1903 (Roster of the ALGONQUIN). Naming of the Revenue Cutter Service, by Act of July 31, 1894 (28 Sta. 171), United States Congress. O’Byrne, Jr., F.X., Lieutenant Commander, United States Coast Guard, The United States Coast Guard, 1993. Secretary of the Treasury, "The United States Revenue Cutter Service in the War with Spain, 1898," Office of The Secretary, Division of Revenue Cutter Service, (Washington, D.C.,: Treasury Department, September 1, 1899). Tariff Act of August 4, 1790 (1 Stat. 175), United States First Congress. U.S.Coast Guard. A Bill S.2337. In the Senate of the United States, May 26, 1913. To create the Coast Guard by combining therein the existing Life-Saving Service and Revenue Cutter Service (38 Stat. 800) 28 January 1915.